I love the color pallet you've chosen! It's so warm and cozy! You can come decorate my apartment when you're done with yours. So cute! 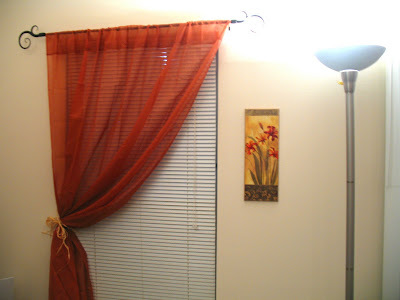 I love it, the drapes with the picture and lamp looks great! I agree that you picked a wonderful color pallet. I also think it is really nice that you walls aren't just white, that really helps when decorating! I love it. I'm trying to figure out how to make our place more homey as well... so I will probably be stealing ideas from you.